We are back with another giveaway. 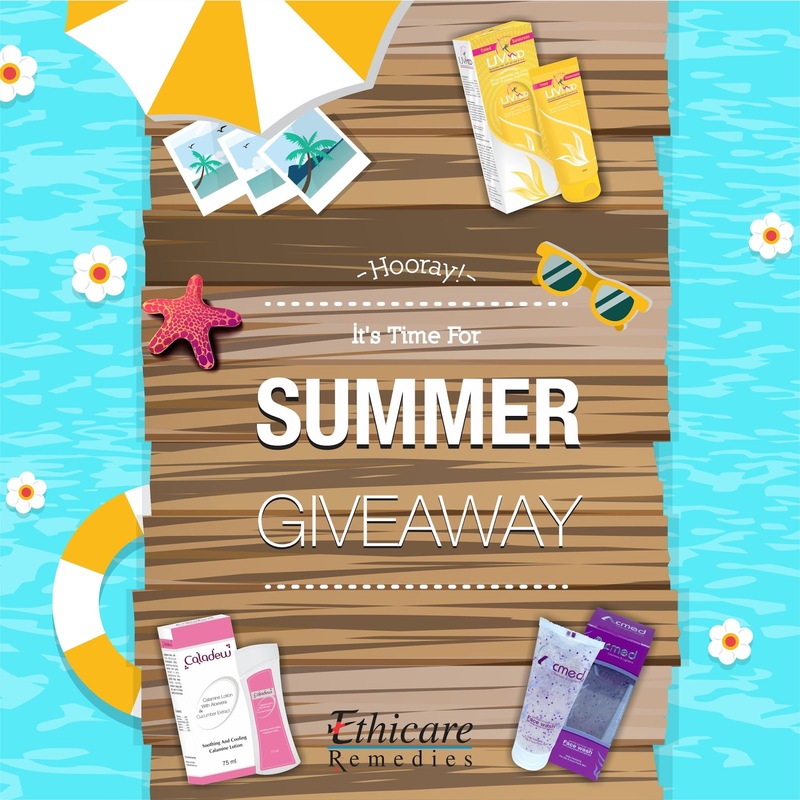 This time we will have 3 winners who will win Summer Essentials Kit from Ethicare Remedies. I have already reviewed the Summer Kit on my blog and each product from the kit will surely help you woo your summer skin problems. Ethicare Remedies is a 12 year old & fastest growing cosmeceuticals company in India. We exclusively focus on dermatology and cosmetology. We promote our products through dermatologists, cosmetologists, plastic surgeons and trichologists. With our best efforts & experience that we have in the field over the years has helped us to get high regards in the eyes of all leading dermatologists & cosmetologists across the country. We are exporting our products in Mauritius, UAE, Yemen, Nepal, Bangladesh, Syria, Iraq, South Africa, Afghanistan, Lebanon, Kenya, Mauritius and Sri Lanka. Enter via the RaffleCopter widget and read the terms and conditions before taking part. The place where it says "Visit page on Facebook" in the RaffleCopter widget you should "Like the Facebook page"
Winners please DM me your full postal address with mobile number on Facebook or Instagram within 48 hours..
1) Giveaway runs for 10 days from 27th May 2016(00:00) to 6th June 2016 (23:59). Giveaway open to Indian residential addresses where the hamper can be couriered. In case the address is where it cannot be couriered, winner needs to provide another address. 2) We will be having 3 (three) winners. 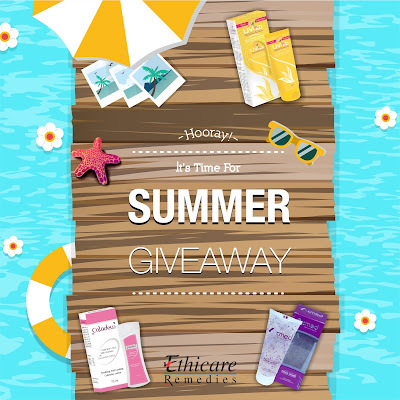 The giveaway is a sponsored one from Ethicare Remedies. And I won't be held responsible in case winner faces any problem. 4) Winner Decision will be final by Ethicare Remedies team and you cannot challenge it. In this case you will be barred from future giveaways. 5) Participants please refrain from saying 'Make me win'. It is just a matter of hardwork but coupled with Luck :).